Many of you have driven across the U.S. 90 bridge in Bay St. Louis, Mississippi and have seen what appeared to be a faded pink castle. It wasn't a castle at all but the deserted building that once housed a luxury resort hotel called Pine Hills. This grand lady's history dates back to 1925, when a group of progressive New Orleans business men planned an elite subdivision on the north shore of the serene Bay of St. Louis. Cypress fringed swamps were filled. Log supported roads were constructed. Concrete side walks soon angled beneath the Pine and Magnolia shaded lots. An eighteen hole golf course fairwayed around a $75,000 palm patio club house. This club house had seven rooms in which people from New Orleans would come and stay. This idea soon gave birth to the real jewel of the project. This five story, reinforced concrete, and hollow tiled type structure with 180 guest rooms and 130 tiled bathrooms was built at the cost of $1,350,000 with $200,000 worth of furnishings. Hal Thompson, president of the Pine Hills Hotel project, made sure that the hotel would please guests coming from the most wealthy homes in America. 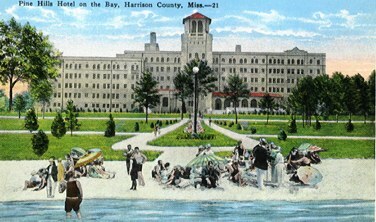 The Hotel opened her doors to her stock holders on December 18, 1926. Dennis Murphy, the Governor of Mississippi, was in attendance. He noted to say," The opening of the Pine Hills Hotel is an important event for the state of Mississippi." It opened to the public on December 20, 1926, and was booked solid through February 1927. The majority of the guests came to Pass Christian by train and were transported to the hotel from Henderson Point in yachts purchased by the hotel company for that purpose and for the pleasure of the guest. The others entered by automobile at the rear of the building, down a mile and a half roadway winding from the old Spanish Trail through the golf course and residential park on the north. 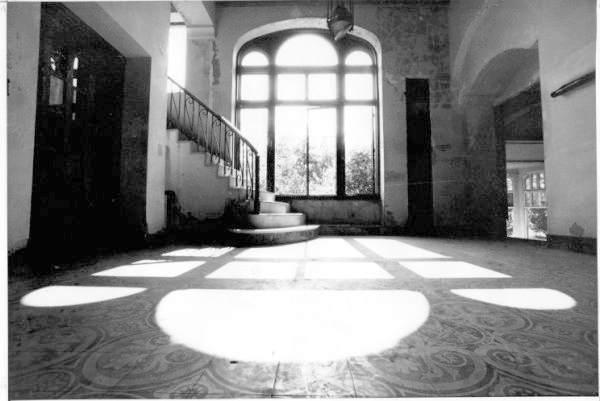 When visitors entered this massive stucco building, the grand lobby, which greeted them, was one of simplistic elegance. This room was separated into two parts. A greeting lobby and an elevator lobby. The greeting lobby was almost void of furniture, containing only the registration desk, the telephone booths, and tobacco stand. The elevator lobby also was bare and only a mosaic fountain was installed as decoration. One of the most interesting rooms among the hotel's many, was the lounge. It was a beautifully proportioned, high ceiling room in the Italian and Spanish Renaissance style. The furnishings kept with the character of the room. Its highly polished hardwood floor was partially covered with six specially designed Bigelow-Hartford rugs two-toned blue and yellow. This number was further carried out by arranging the furniture in individual groups of six sets, a group for each rug. The large fireplace group included a large walnut hand- carved Italian Renaissance table with a picturesque imported Spanish vase in the center, and several high-back red lacquered chairs which added a note of general formality to the room. In still another group were several imposing high-back chairs, all of which were hand carved and upholstered in the finest imported frieze. At the far end of the room was a special ladies' section with Venetian sofas, arm chairs and coffee tables. At the entrance was the lounging group, consisting of massive sofas and hand carved easy chairs. The other two groups were special card table and occasional groups consisting of four unusual hand carved chairs and Italian renaissance walnut occasional tables. The many ferns, palms, and other plants were placed in Chinese Jardinières or in standing green-toned boxes which added an attractive note to the room. A handsome electric Steinway piano occupied one corner of the room. The walls were in a neutral tint with out adornment but the ceiling was made up of many panels of beautiful wood painted in hand wrought stencils. The window drapes were exceptionally fine, with mulberry silk velour being used. The drapes were in the kings claw design, hand appliquéd in gold, and trimmed with silver fringe and tassels. Each window had a antique gold cornice and the side curtains were in a light toned brocade known as "galore of the kings" a direct copy of the fabric used in one of the European palaces of that day. 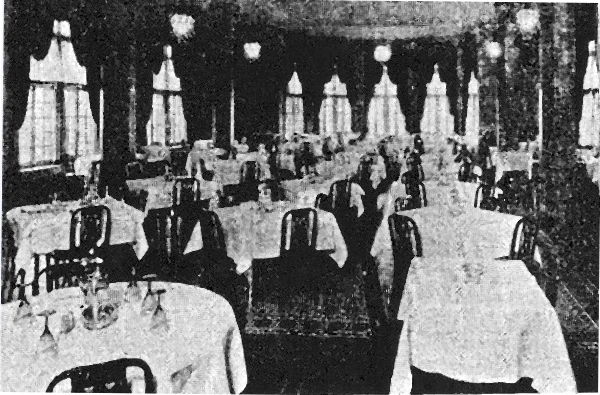 The dining room was thought by many to possess the greatest charm of any room in the hotel. It was entered by a wide mosaic tiled staircase of ten steps from the lobby. This room was filled with light from the tall French windows that reached to the ceiling and opened directly on the green terrace. The floor was heavily carpeted over a beautiful mosaic tiled floor. The center rugs could be removed and the central space of the room could be used for dancing. The window drapes were of burnt orange silk velour with and over valance of black satin, the curtains arranged in opera drape style. The tables were green painted wood and the green chairs were upholstered. The walls in a green tint harmonized with these tones. The glass used was amber; the white china trimmed in green carried the Pine Hills Crest and two pine trees, while the service plates had a wide burnt orange border, matching the draperies and carried the Pine Hills Crest in the center; the console was an antique Spanish piece and silver service on it was beautifully wrought. The uniforms of the waiters were attractive, being swallow-tailed coats, black and white vests, orange collars and Pine Hills buttons. Across the hall from the dining room was the Jack and Jill room for the children, furnished in blue and ivory painted furniture, quite a nice setting for the little folks. 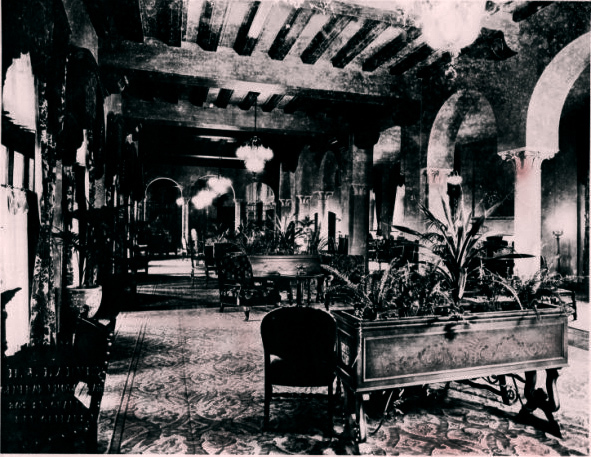 The grill below the lobby was a unique room with its flagstone floor, deep red tinted walls and hangings of imported monk's cloth in many deep shades of coloring. This room was for the convenience of the golf players who did not wish to dress formally for dinner. The light was thrown into the grill from lantern light. The bedrooms showed the same care fully chosen furnishings found on the first floor. They were all solid carpeted. The carpets used showed three patterns, suited to the furniture, while the drop curtains were silk marquisette. Opaque shades were used in all the rooms. The furniture was exclusively designed for the hotel in 3 colors schemes - parchment green, oyster grey and walnut. Each room contained other than the bed, a table lamp, bed lamp, nightstand, upholstered grip stand, upholstered chairs, desk and ash tray. The bedspreads were in white and showed the Pine Hills crest and two pine trees interwoven. The same design was on each blanket. Parlors were to be had with many of the rooms. These were quite attractive, with their odd pieces of furniture. Some of them were in Japanese style. One of the dainty end corridor parlors showed love seat, easy chair, desk ash tray, lamp, all in assorted types, creating a pretty whole. Another beautiful feature of this grand lady was the roof top garden on top of the dining room. You would enter this garden from the second floor. It was furnished with enameled umbrella tables arranged in groups with the umbrellas in Spanish colors. Around these tables were exotic plants in Spanish planters. Even the kitchen, pantries, and laundry rooms were equip with the most up-to-date labor saving machinery. Mrs. D.M. Fields of Mobile, was in charge of the housekeeping department. She had a corps of fifteen maids and three parlor maids working with her to help maintain the laundry of the hotel and the laundry of the Pine Hills subdivision. The hotel was also equipped with central air conditioning and heating. This was a feature that was not common in constructions of that time. The garage was an unusual feature of the hotel project. It was of circular construction, with one large opening facing the hotel. The garage would accommodate 64 cars. The hotel president Hal Thompson stated that there was but one other garage of similar construction, and it was located in England. The plans for this garage were furnished by Ralph Rodney Root from England. So closely allied with the Pine Hills project was Pine Hills, Inc. Some 2,300 acres of land were owned by this company, taking in 3 1/2 miles of shore line on the Bay of St. Louis. 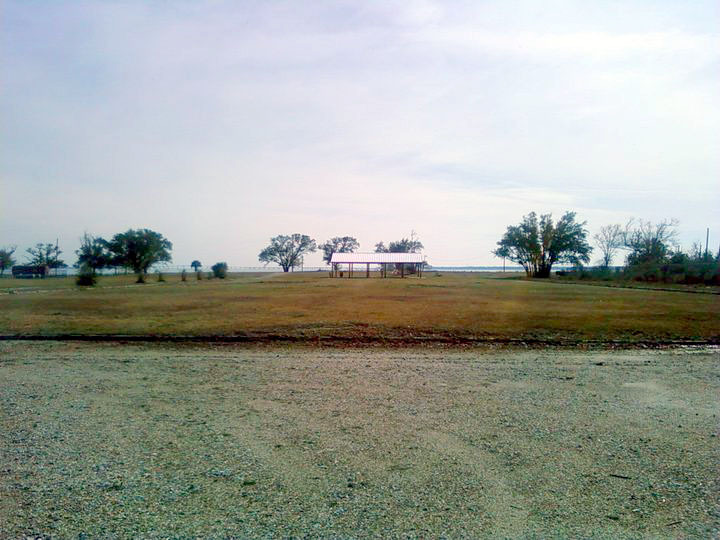 One unit of 100 acres of this land, lying north and west of the hotel was the first to be developed. Five modern residences were completed on the grounds, three were built by George Veeder of Schenectady, N.Y., and one by Miss Margaret Le Barr of New Orleans. Seven artesian wells supplied the water for the three developments, four were used for the land unit and hotel and three for the golf course and country club. Roadways of gravel were laid throughout the development. The sales end of Pine Hills Inc., was handled from the Pine Hills office in Pass Christian. Mr. H. S. McLeod was the sales manager. The hotel felt her first fatal blow when highway 90 was rerouted across the bay in 1928. When the hotel project was first started the highway was to skirt the bay but now the Pine Hills Hotel was left isolated off the beaten path. What finally killed this grand lady was the stock market crash in 1929. The hotel was forced to close after two of the three banks that held the notes on the hotel closed. She sat empty occupied only by Lenard Beach, who was appointed by the hotel corporation as caretaker. 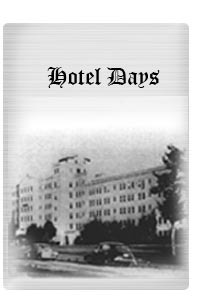 In 1942 World War II broke out and this started the second chapter in the hotels history. The United States Army used her for a training camp for soldiers before going over seas. Six months later she was left empty again until June 2, 1953 when the Roman Catholic order of the Oblate Fathers of Mary Immaculate signed the deed to the property. This was a big step in expanding the ministry of the OMI in the southern states. The first Oblates arrived at Pine Hills on June 10. Father John Taylor was installed as superior. Our Lady of the Snows Scholasticate opened on October 26, 1953 with five priests, six brothers, and 59 scholastics. After many months of hard work and much renovation Our Lady of the Snows was dedicated on August 10, 1954 by His Eminence, Valerio Cardinal Valeri. The Pine Hills dining room was turned into a library; the Spanish Lobby was their chapel. 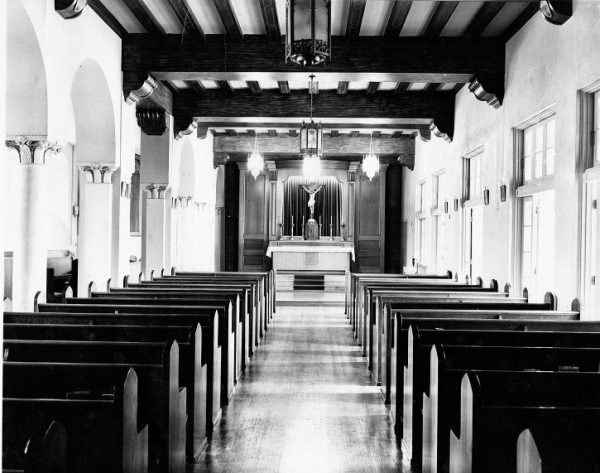 In March 1965, their chapel took on a new look. A multicolored mosaic back drop was added along with a new alter made of Bedford stone with matching Lectern. On January 5, 1968, Father Singer officially announced that Creighton University would be the house of Philosophy thus ending 15 years as a scholasticate and another chapter of the Pine Hills story. Pine Hills again sat empty. 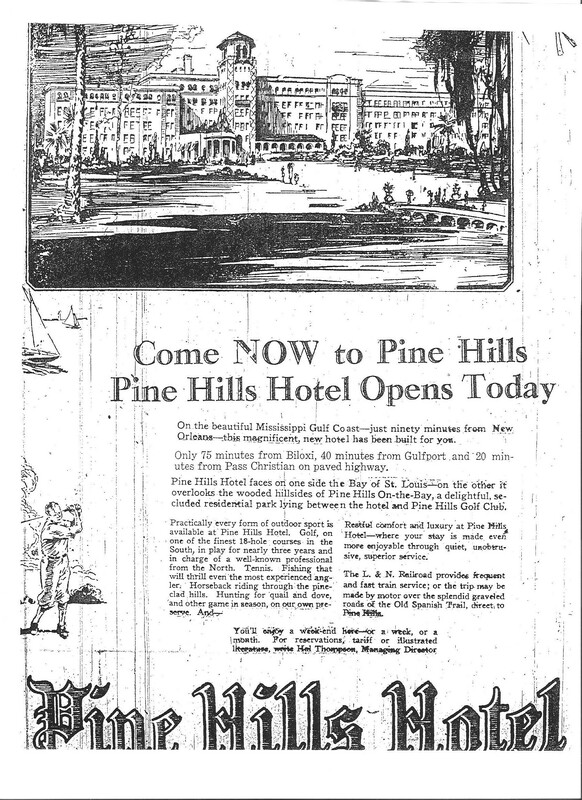 In 1976 Pine Hills almost got a second chance as a luxury hotel. An unnamed firm from New Orleans had a one year option on her and planned to restore her to her original condition. Some thing didn't work out and she sat empty. In 1979 a Bay St. Louis man, Bob Waterman wanted to open her for a shelter for battered women and unwed mothers. This also was never completed. In 1981 Pine Hills was sold to Southern Scottish Inns Inc. with plans to turn this once luxurious hotel into condominiums and town houses. Renovation started that summer. The top floors were cleared, balconies were started but the project came to a screeching halt in 1983. Again Pine Hills was on the block. On July 7, 1983, an option agreement between Southern Scottish Inns and Taylor-Ward Consultants, Inc. was signed. Again Pine Hills had a chance to be reborn as a luxury resort hotel. Blue prints were drawn up and developers were contacted. 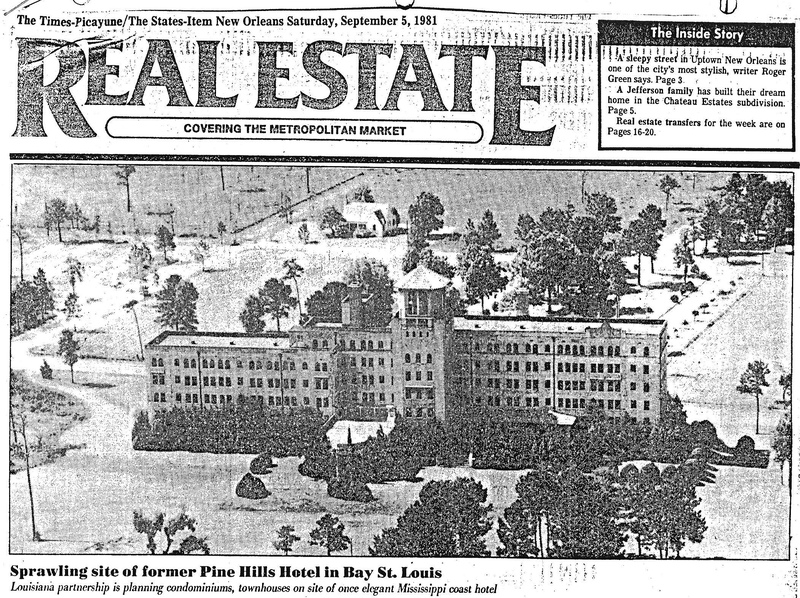 This was soon put to a stop by the sale of the hotel and 83 acres of land, on January 3, 1984, to Sunshine Properties of Mississippi. On January 5, 1984, the property again changed hands by use of a "Quick Claim Deed," issued by Sunshine Properties of Mississippi to the DuPont Chemical Company. The DuPont Chemical Co. has been neighbors to the hotel since the plant opened in 1979. The DuPont Co. purchased the hotel building and the 83 acres for the sum of $2,000,000. David L. Settle, DuPont's DeLisle plant manager, said that they had no interest in expansion or in dismantling the hotel building. In the summer of 1983, a group met in a hotel room at the Southern Scottish Inns in Slidell. The main reason was to discuss what they could do to save Pine Hills and get her restored to her original beauty. In that room that Saturday, the Pine Hills Historical Society was born. The founding members that were present that day were former caretaker, Ron Paton, Pine Hills Historical Society secretary, Donna Craft, PHHS President David Wiseheart, and Mike Westerman. The Pine Hills Historical Society started to work to see how the Pine Hills Hotel could be placed on the National Historical Register. After the sale of the hotel to DuPont, the Society tried to find out DuPont's interest for the property. With no real response from DuPont, the Society tried to work for Registration without DuPont's help. As the project grew, so did the numbers in the Society. After a newspaper article published in the Sea Coast Echo, on June 1, 1986, DuPont came forward and informed us of their plans to raise this grand lady in July or August. Upon this announcement, the Pine Hills Historical Society went to work getting petitions signed, representatives contacted, and support from local officials. 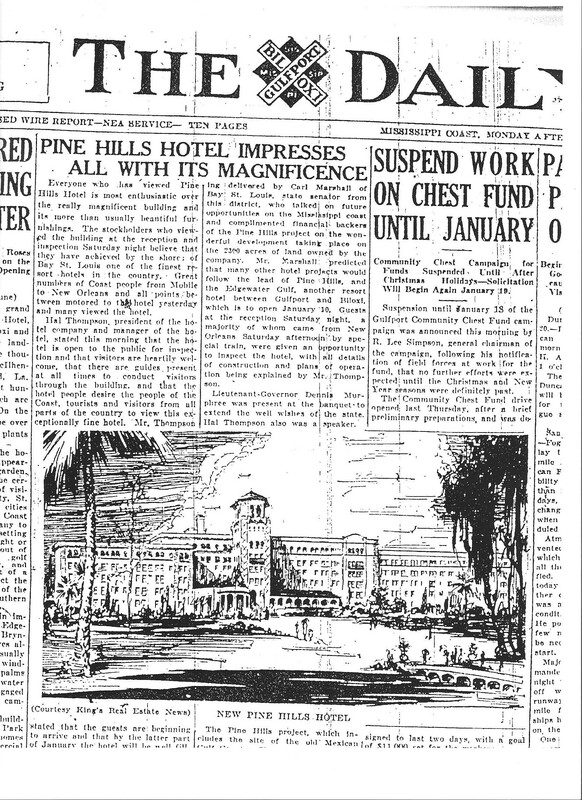 As the fight to save the Pine Hills Hotel continued, so did DuPont's efforts to bring Pine Hills to her knees. First DuPont planned to use controlled explosives, then decided to use a more convenient means to bring the hotel down. The Pine Hills Historical Society contacted Taylor-Ward Consultants, Inc. to see if they were still interested in the Pine Hills Hotel. The response came back quickly. Yes. They found a backer who was willing to put up the money for a restoration project. 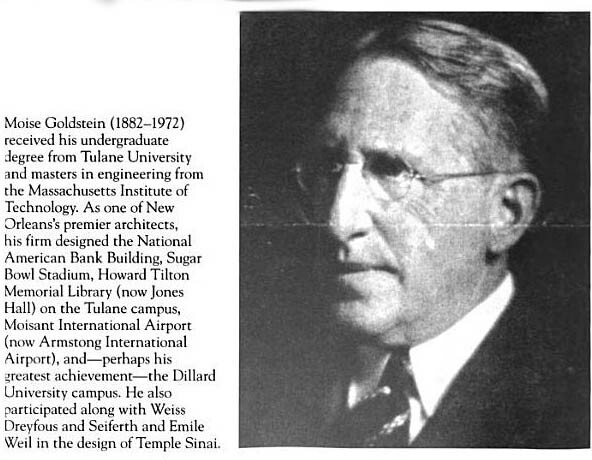 Moise Goldstein, the architect who designed the Pine Hills Hotel. Aug 17, 1924 "The Mexican Gulf County Club"
Describes the Golfing at PH and all the buildings once there before the hotel was built. Notes from a priest who lived there about history of buildings there. Magazine article about the hotel history. Oct 1981 Classified Ad Hotel for Sale ? 1981 Announcment of "Condo Plan"